This is me having a little fun with some of the vegan products I've been discovering lately. So if brown rice noodles sound all fancy and obscure, know that this can easily be substituted with regular spaghetti (brown, if possible, for all that extra fibre and good stuff). Equally, the vegan mince I've used in the bolognese sauce can be replaced with anything from cooked beans to peas to lentils for a similar hearty taste and texture. 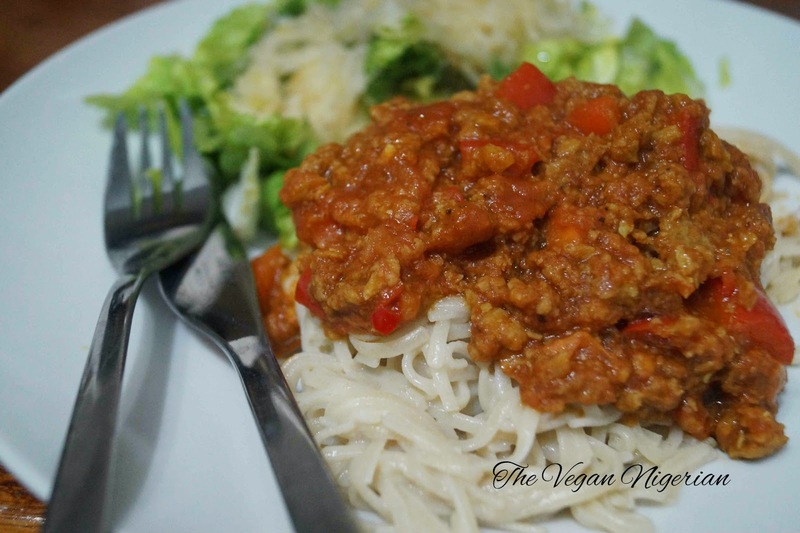 If you do happen to have access to vegan mince such as the one made by VBites or the type stocked at Holland and Barrett, then go ahead and give it a go! This meal was borne out of a craving for something rich, comforting and packed full of flavour. Bolognese ticks all those boxes and then some. I have to say that I am constantly amazed at how easy it is to create vegan versions of old favourites and massive kudos to the food companies out there that make this possible. I made a big batch of the bolognese sauce and stored the leftover in a plastic container. It should keep for about 3 days in the fridge. Start by making the bolognese sauce. Heat the olive oil in a large pot and add all the chopped vegetables (peppers, tomatoes, chillies, onion), sauté for a couple of minutes. Add the vegan mince and stir to combine with the vegetables. Add the tomato sauce, stir and season the sauce with the salt, turmeric, chili flakes and vegetable stock cube. Simmer on low-medium heat for 8-10 minutes (watch out that the sauce doesn't stick to the bottom of the pot; stir occasionally). Make sure the sauce is piping hot before serving. Cook the brown rice noodles (or spaghetti) as you would normally cook your pasta. Serve hot with a side of fresh salad to get those extra greens in. Enjoy! Hi :) We met on VRH on Twitter tonight- love the look of your blog, Now following and looking forward to reading all your recipes!